The editorial expressed concern with Spain’s deteriorating image abroad. But its defensive tone also betrayed insecurity. The escalation of the conflict over Catalonia since early September has revealed the depth of Spain’s constitutional crisis, which the central government’s harsh response to the Catalan challenge has only served to deepen. The government’s approach has also undermined judicial independence, eroded civil liberties, and reversed decades’ worth of decentralization. Meanwhile, Rajoy and his party, the conservative Partido Popular (PP), have used the Catalan conflict to their advantage. Over the past two months, the standoff with Catalonia has conveniently served to distract from revelations of rampant corruption in the PP. The Catalan right has borrowed from Rajoy’s playbook, also using the escalation of tensions to whitewash its own history of corruption and enthusiasm for austerity. Have Spain and Catalonia Reached a Point of No Return? But how did we get here? Following Catalonia’s October 1 referendum, a month-long game of chicken between Madrid and Barcelona ensued. The Catalan government threatened to follow through on the vote’s independence promise—43 percent turnout with over 90 percent in favor—unless Madrid sat down at the negotiating table. Madrid, meanwhile, threatened to revoke the region’s self-rule unless Catalonia disavowed the referendum, which Spain’s Constitutional Court had declared illegal. On October 27, after feverish last-ditch attempts to reach a deal failed, things came to a head. The Catalan parliament voted for independence; the Spanish senate approved the imposition of direct rule. Rajoy’s government swiftly dissolved the Catalan parliament, fired President Carles Puigdemont and his cabinet, and called for new regional elections on December 21. The deposed Puigdemont immediately fled to Brussels with some of the members of his cabinet. In the days that followed, some of the remaining cabinet members, including Vice President Oriol Junqueras, were preventively jailed by the country’s National Criminal Court on charges of rebellion, sedition, and embezzlement, while other members of parliament faced similar charges in the country’s Supreme Court. (Earlier in October, two Catalan civil-society leaders had also been jailed on sedition charges.) Puigdemont, who turned himself over to a Belgian court that is studying a European arrest warrant from Spain, has meanwhile announced that he’ll be a front-runner in the upcoming elections, although he disputes the legality of the manner in which they were called. For December’s regional elections, many predict a result similar to the 2015 polling, when pro-independence parties lost the popular vote but won a parliamentary majority. The elections have been presented as a regional “reset.” But many forecasts predict a very similar result to the region’s 2015 elections, in which pro-independence parties narrowly lost the popular vote but commanded a parliamentary majority. Unlike in 2015, this time there will be no broad pro-independence coalition. But pro-independence parties, which in addition to Puigdemont’s center-right party (PDeCAT) include the Left Republicans (ERC) and the radical Popular Unity Candidacy (CUP), may well end up, once again, with a majority of seats in the Catalan parliament, prompting a potential repetition of moves in a Catalan version of Groundhog Day. Still, the past several weeks have clarified a number of key issues in this latest chapter in the Catalan saga. First, the Catalan government never really meant to become independent—at least not anytime soon. 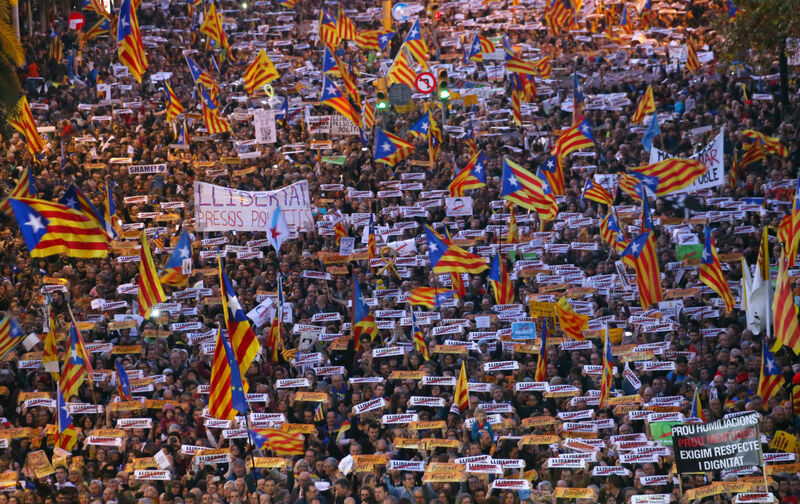 Second, Catalans are deeply divided over independence. Third, the crisis has provided the central government in Madrid a golden opportunity to divide the opposition and curb not only regional self-rule but constitutional rights more broadly. And, finally, the crisis has served to embolden all sectors of the Spanish right, from neo-fascists to neoliberals. The young anti-independence Ciudadanos (Citizens), once considered a buttoned-up pro-business party, has increasingly embraced the right-wing populism that is so popular elsewhere in Europe. Today, Ciudadanos is soaring in the polls. The Catalonia crisis has provided the government in Madrid a golden opportunity to divide the opposition and curb not only regional self-rule but constitutional rights more broadly. The divisive effects of the recent escalation have been most devastating in Catalonia itself, which in two months’ time has seen a massive influx of Spanish police, a corporate exodus, half a dozen mass demonstrations—both for and against independence—and two general strikes. Although many Catalans would like to remain part of Spain, support for an independent republic is strong among nearly half of the population. An overwhelming four-fifths’ majority supports the right to self-determination. Yet the politicians who claimed to guide Catalonia toward a bright, independent future turned out to have no actual plan in place. For the journalist Guillem Martínez, this was obvious from the beginning. In his view, the “road map toward independence” that the Catalan government has brandished since 2012 was little more than an opportunistic ploy, part of an elaborate game to shore up electoral support, force Madrid to allow Catalonia more fiscal autonomy, and hide the dirty laundry of President Puigdemont’s party, which has rebranded itself as the Catalan European Democratic Party (PDeCAT). Even the culminating parliamentary vote on October 27, it turns out, was not quite a declaration of independence but a nonbinding proposition urging the Catalan government to proclaim the republic, which it never actually did. Back in Madrid, the Spanish central government conveniently pretended that it had. Invoking Article 155 of Spain’s Constitution, it suspended 40 years’ worth of regional self-government with a stroke of the pen. Prime Minister Rajoy presented a battery of unprecedented measures—not just the dissolution of the Catalan parliament but the takeover of all government functions, including the police force, the educational system, and public radio and television—as necessary steps to restore the rule of law and return to “normalcy.” But governing Catalonia now is the PP, a party that in the last regional elections came in fifth with just over 8 percent of the vote, while the democratically elected government is in prison or facing jail sentences. The PP’s standoff with Catalonia began in 2006, when the party, then in the opposition, filed an appeal with Spain’s Constitutional Court against a newly approved statute of autonomy for the region. Since then, the PP has repeatedly resorted to the judiciary to do its political dirty work, using the attorney general as an extension of the executive branch to put pressure on the courts in an attempt to cow political opponents. The PP has also used the Constitution and recent changes to security legislation—known as the ley mordaza, or “gag law”—to curb freedom of assembly and press coverage. Conservative members of Spain’s judiciary have been happy to play along. In recent years, rap artists, puppeteers, Twitter personalities, and comedians have found themselves in court facing charges of “extolling terrorism” or “offending religious sentiments,” while journalists have been charged with “disobeying authority” and slapped with hefty fines for such actions as stepping from the sidewalk into the street during a demonstration in defense of press freedom. On November 17, Spain’s Supreme Court ruled that the crime of extolling terrorism can even apply to a retweet. In late October, the anti-corruption prosecutor delivered a devastating report that wrapped up a decade-long investigation into the illegal financing of the PP. Leftist Barcelona Mayor Ada Colau, Podemos leader Pablo Iglesias, and many others in recent weeks have called the jailed Catalan politicians and the two civil-society leaders “political prisoners.” The right’s push to criminalize legitimate political positions may lead not just to the detention of political leaders but to the banning of political parties. Casado, the PP spokesperson, has approvingly recalled the prohibition, in the 1990s, of Herri Batasuna, the Basque party linked with ETA, the terrorist pro-independence group, suggesting, in so many words, that political parties in favor of Catalan independence should therefore be illegal. Ironically, Spain has a legal fascist party, whose vocal members have, in recent weeks, been seen brandishing Francoist flags, making fascist salutes, singing fascist hymns, and violently attacking anti-fascist protesters. The PP leadership has been slow to condemn these actions. In fact, the PP has long resisted calls to bring Spain in line with other European countries by making fascist symbols illegal. The most consequential outcome of the Catalan crisis may have little to do with the crisis itself: It has served to distract citizens from the wide-ranging corruption revelations in the Partido Popular. In late October, during the days leading up to the independence vote in the Catalan Parliament, anti-corruption prosecutor Concepción Sabadell delivered a devastating report that wrapped up a decade-long investigation into the illegal financing of the PP. Sabadell is in charge of the Gürtel case, named after the mastermind of the corruption ring, Francisco Correa, whose last name means “belt” in Spanish (Gürtel in German). Sabadell’s report confirmed that several of the PP’s regional branches, as well as its national headquarters, for many years kept a set of shadow books to log illegal commissions pocketed from corporations in exchange for major government contracts. Among the direct beneficiaries of these commissions were middlemen (Correa and his accomplices), dozens of PP politicians (who received bribes or under-the-table salary supplements directly from the party’s treasurer), and the party organization itself, which used the money, among other things, to finance its campaigns—in effect undermining the legitimacy of the elections. When Prime Minister Rajoy was called to testify in the case, in late July, he claimed he did not know about the corruption scheme because he had never been in charge of the party’s finances. He also denied ever having received payouts from the shadow books. But that testimony was undermined on November 7, when Manuel Morocho, chief inspector of the economic and fiscal delinquency unit of Spain’s national police, testified before a congressional committee charged with investigating the PP’s illegal financing. Asked whether he believed that Prime Minister Rajoy had been the recipient of under-the-table payouts, he confirmed there was evidence to indicate that he did. Morocho’s investigation of the party, so far, extends back to 1999 and includes all of the party’s leaders and treasurers. He described having found “corruption in its purest form” but lamented the party’s numerous attempts to “destabilize” his investigation through spurious lawsuits. While such revelations would be grounds for Rajoy’s impeachment, its coverage in major newspapers has been minimal and, on Spanish public television, practically nonexistent. The Gürtel case, moreover, is only one of many such investigations keeping the Spanish courts busy. In mid-November, Francisco Granados, a former top PP official in the regional government of Madrid, faced trial for his involvement in a similar corruption scheme. Meanwhile, on November 15, the PP itself was criminally charged for tampering with evidence. (In 2013, the party leadership ordered the destruction of two hard drives that potentially contained data on its shadow books.) On November 17, a trial opened against former PP economy minister and IMF director Rodrigo Rato, for cooking the books during his tenure at the helm of Bankia, a major Spanish bank. Behind a cloak of martyrdom, Catalan leader Carles Puigdemont and his party have blurred the memory of their own corruption scandals. These cases point to the measure of independence that parts of the Spanish judiciary have managed to maintain. But, more consistently, they have revealed the high level of collusion between the executive branch and the courts. An intercepted phone conversation between an indicted PP official and a former PP minister in a parallel case, for instance, showed how the official was able to influence a key judicial appointment that directly affected his case. Such dealings behind closed doors are assumed, by many Spaniards, to be commonplace. What might sound like electoral catnip for the opposition has been anything but. In the Spanish Parliament, where the PP governs without an absolute majority, the Catalan crisis has somehow further divided the country’s two largest opposition parties, the social-democratic PSOE and the young anti-austerity party Podemos. While the PSOE supported the imposition of direct rule in Catalonia, Podemos has from the outset argued that the only political solution to the Catalan challenge is a binding referendum on self-determination. The PSOE’s submissive role as a handmaiden to the PP’s hard-line centralism has alienated its progressive allies in Catalonia. (Its party leadership went ahead with supporting the PP’s invocation of Article 155 without consulting its membership, a move some believe was meant to avoid an internal vote against the deal.) But Podemos’s middle-of-the-road position, too, would likely punish the party at the ballot box were a national election to be held anytime soon. The Catalan crisis, fueled by a politicized media, has polarized opinion around issues that for many in Spain are deeply emotional. Any political stance that falls somewhere between strongly pro-independence and strongly anti-independence has little galvanizing power. To make matters worse, the issue has caused fractures within Podemos. Ciudadanos, by contrast, whose aggressive Spanish nationalism in response to the Catalan independence movement has pulled the PP even further to the right, is seeing its support skyrocket. The collusion among corporate, political, and media elites that the scandals reveal has long been the bedrock of what many in Spain call “the regime of 1978”: the political order that emerged from the negotiated transition from the Franco dictatorship to a parliamentary monarchy. It was against this order, which featured an insurmountable two-party system, that, in 2011, thousands of “indignant” Spaniards took to plazas across the country in protest. Three years later, Podemos was created in order to break it. But the elites in Madrid and Barcelona, today at each other’s throats, have both bought themselves new leases on life, quelling the once-powerful citizen critique. Still, the hope for political renewal remains strongest in the three bilingual regions that have long had their own national identity: Catalonia, Galicia, and the Basque Country. In all three regions, the presence of nationalist parties since the transition to democracy meant that the two-party system never fully took hold. It is there, too, that Podemos and its allies have made their deepest inroads, leaving the country’s two major parties, PSOE and the PP, with barely more than a residual presence. For the December 21 elections in Catalonia, Podemos has joined Catalunya en Comú (“Catalonia in Common”), founded last year by Barcelona mayor and former anti-eviction activist Ada Colau, and headed up by Xavier Domènech, a charismatic historian from the Autonomous University of Barcelona. Although “Els Comuns” are being outpolled by the pro-independence ERC and PDeCAT, they may well end up playing a key role in the formation of a regional government if the pro-independence bloc falls short of a parliamentary majority. With their focus on the economy, they are well-placed to siphon progressive votes from two of the three pro-independence parties, ERC and CUP. Electoral success would allow Domènech and Colau to push the focus away from independence and toward the economy. It also may put into play what they see as the only political solution to the national question: a binding referendum.